In 2010, American teenager Tyler Clementi reacted to his public “outing” by his roommate by throwing himself off New Jersey’s George Washington Bridge. The incident whipped media into a frenzy, even prompting Ellen De Generes to comment publically that ‘something must be done’. Friday September 7 is Wear it Purple Day, an annual day that calls on people to wear the regal colour to show their support of LGBTIQ youth and take a stand against bullying. It seeks to empower young people to be proud of who they are, who they love, and how they define themselves. So if you happen to find yourself wading through a sea of purple t-shirts today, know that it’s no coincidence, and remember the campaign’s simple message: ‘You have the right to be proud of who you are’. 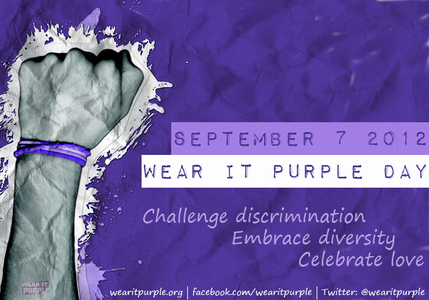 For more information on the campaign, visit www.wearitpurple.org. You can show your support online on Facebook and Twitter. This entry was posted in Get Involved and tagged campaign, LGBTIQ, suicide. Bookmark the permalink.